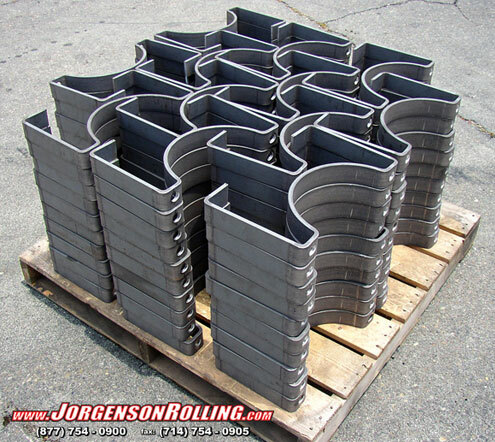 JORGENSON Rolling – We specialize in Custom Formed Pipe Clamps, Pipe Straps, Pipe Saddles, Pipe Supports, Pipe Shields, Pipe Sleeves, and other custom fabricated pipe accessories. 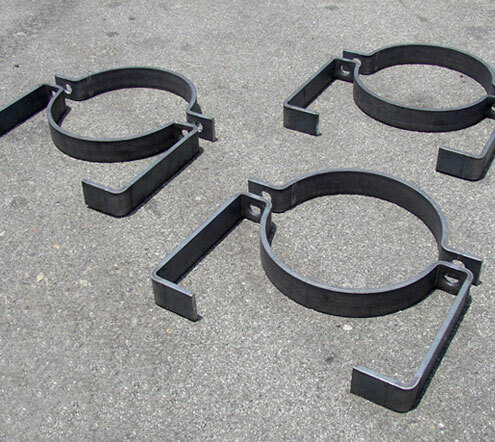 These are custom fabricated Pipe Clamps, fabricated out of 1-1/4” thick x 7” wide Mild Steel plate. 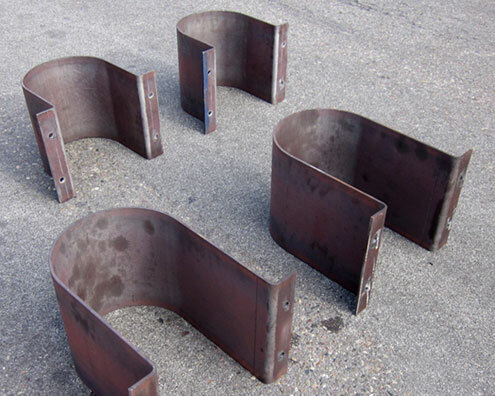 These Pipe Clamps were custom fabricated to our customer’s specifications. If you need to have Pipe Saddles, Pipe Straps, Pipe Clamps, or Pipe Supports custom fabricated give us a call. 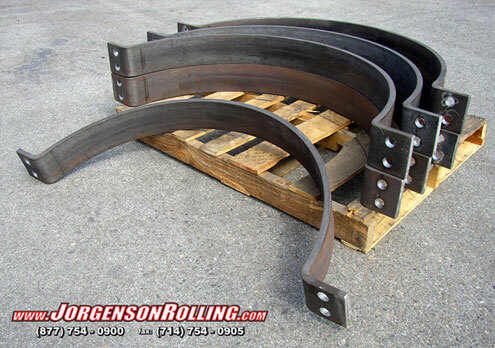 At Jorgenson Metal Rolling & Forming we offer a wide range of diverse metal fabrication services including bending, shearing, punching, rolling, forming and welding. We can custom fabricate many products including brackets, tanks, frames, ladders, clamps, and weldments just to name a few. We are a fabricator of all metals including, carbon steel, aluminum, stainless steel, copper and bronze. These are custom fabricated Offset Pipe Clamps, fabricated out of .375" thick x 2.0" Carbon Steel flat bar. 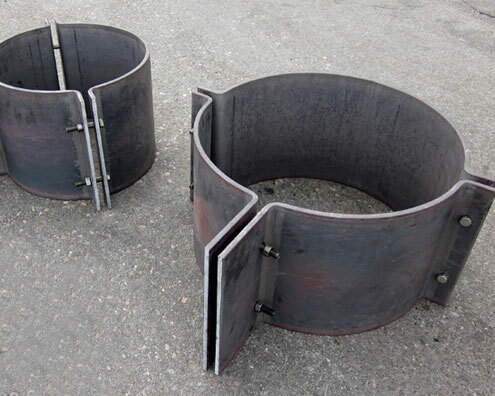 These Offset Pipe Clamps were custom fabricated to our customers drawings and specifications. 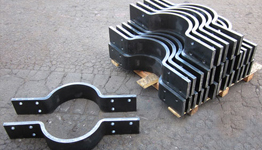 If you need to have Pipe Saddles, Pipe Straps, Pipe Clamps, or Pipe Supports custom fabricated give us a call. At Metal Rolling & Forming we offer a wide range of diverse metal fabricator services including bending, shearing, punching, rolling, forming and welding. We can custom fabricate many products including brackets, tanks, frames, ladders, clamps, and weldments just to name a few. We fabricate all metals including, carbon steel, aluminum, stainless steel, copper and bronze. These are custom fabricated Pipe Clamps, fabricated out of .5" thick x 5.0" Carbon Steel flat bar. 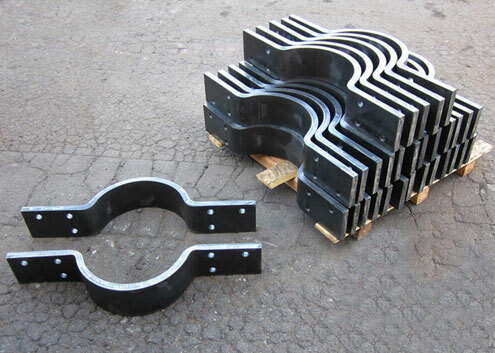 These Pipe Clamps were custom fabricated to our customer’s specifications. If you need to have Pipe Saddles, Pipe Straps, Pipe Clamps, or Pipe Supports custom fabricated give us a call. At Jorgenson Metal Rolling & Forming we offer fabrication services including bending, shearing, punching, forming, rolling and welding. We can custom fabricate many products including brackets, tanks, frames, ladders, clamps, and weldments just to name a few. This is a custom fabricated Pipe Strap, fabricated out of .5" thick x 14.0" Stainless Steel plate. This strap was rolled, bent, and punched in our custom metal fabrication shop. If you need to have Pipe Saddles, Pipe Straps, Pipe Clamps, Pipe Supports or Pipe Guards custom fabricated give us a call. At Jorgenson Metal Rolling & Forming we offer a wide range of diverse services including bending, shearing, punching, forming and welding. 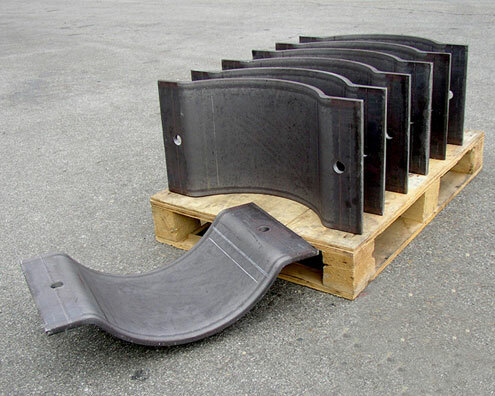 Our rolling and forming department specializes in plate rolling, sheet metal rolling, angle rolling, channel rolling, beam rolling, pipe rolling, tube rolling and many other structural shapes. 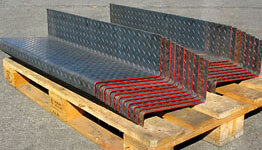 We have been a Custom Metal Fabricator in California since 1984. 3 piece custom designed Pipe clamp, Pipe hanger, fabricated from .375" thick x 14.0" Carbon Steel plate. Jorgenson is a custom fabricator of Pipe Saddles, Pipe Straps, Pipe Clamps, Pipe hangers or Pipe Supports. We are a full service custom metal fabrication company serving the metals industry since 1984. 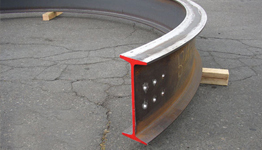 Our services include rolling, bending, forming, welding, shearing, punching and cutting. Our rolling and forming department specializes in plate rolling, sheet metal rolling, angle rolling, channel rolling, beam rolling, pipe rolling, tube rolling and rolling of many other structural shapes. These are custom fabricated Pipe saddles. Fabricated from 1/2" thick x 12" wide carbon steel plate. 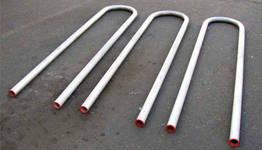 At Jorgenson Metals and Fabrication we can manufacture custom Pipe Saddles, Pipe Supports, Pipe Straps and Pipe Sleeves. In our custom metal fabrication facility we can do heavy plate bending using our 500 ton 18 foot press brake. 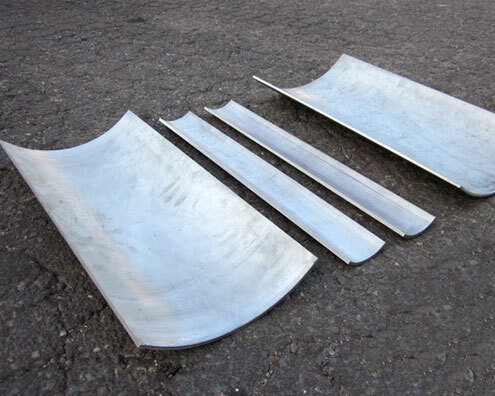 At Jorgenson Metal Rolling & Forming, we specialize in plate bending and plate rolling along with custom metal fabrication. We can also roll most structural shapes such as beam rolling, angle rolling, pipe and tube rolling, and channel rolling. 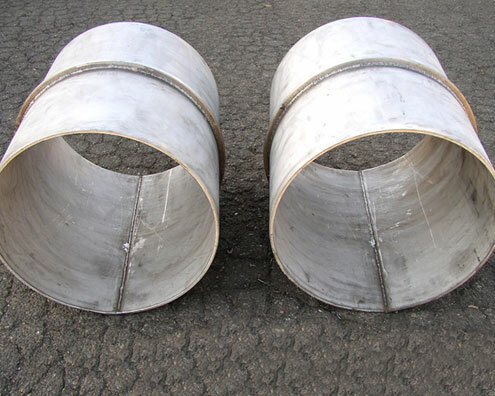 These are custom fabricated Pipe Sleeves, fabricated out of .25" thick Stainless Steel plate. These sleeves were rolled, and welded in our custom metal fabrication shop. If you need to have Pipe Saddles, Pipe Straps, Pipe Clamps, Pipe Supports or Pipe Guards custom fabricated give us a call. At Metal Rolling & Forming we offer a wide range of diverse fabricator services including rolling, bending, shearing, punching, forming and welding. Our rolling and forming department can help you with plate rolling, sheet metal rolling, angle rolling, channel rolling, beam rolling, pipe rolling, tube rolling and many other structural shapes. We have been in the business of Custom Metal Fabrication in California since 1984.